Although you might love your child’s pediatrician, sometimes you may wonder if you need to see a specialist who has a deeper understanding of a particular issue. Unless your doctor refers you elsewhere, it’s difficult to discern whether or not you need a specialist to examine a particular area in greater depth. There is never any reason to fear asking for a referral to see a specialist. It will not insult your pediatrician if you do so. Pediatricians are general doctors, and they do not have the extensive knowledge that specialists do in their particular fields. You should also not worry about being overly cautious or paranoid when it comes to your child, because it’s always better to err on the side of caution when the concern in question relates to your child’s emotional or physical well-being. That being said, there are many times that a good pediatrician or family doctor will be all you need. Here are ten times you definitely should seek out a pediatric specialist. You Suspect a Developmental Delay – If you suspect attention deficit disorder, autism spectrum disorders, learning disabilities or if your child is very behind in meeting the developmental milestones, seeing a developmental pediatrician is a good idea. Recently, many general doctors have begun to shy away from making these kinds of diagnoses and prescribing medication for them. Because this is all the developmental pediatrician does, they are often more up-to-date on the latest information and treatments. A developmental pediatrician can also help guide you through what other professionals your child should see and what other tests you should have performed. Your Child has a Severe Asthma Attack – If your child has had a severe asthma attack that required hospitalization or his asthma is not well controlled even when following the doctor’s guidelines, you should consider seeing a pediatric pulmonologist. Additionally, if your child has a cough or congestion that never goes away, he coughs when exercising or he seems to stop breathing in his sleep, you should seek out this specialist. Behavior or Mood Issues – As a parent, it is up to you to decide whether your child is “going through a phase” or could use some help, but generally speaking if your child seems depressed, withdrawn, aggressive or is having a tough time adjusting to a big change or tragedy, taking her to a therapist or child psychologist is a good idea. Many counselors use play therapy so that the children enjoy going. Therapy can help kids develop coping skills that they can utilize for the rest of their lives. Your Child is Not Listening to You – If your child is unresponsive when you call her in for dinner or tell her it’s homework time, she may not be ignoring you. Many kids have auditory processing disorders, and taking them to an audiologist can help determine if this is the case. Not all kids with hearing issues have difficulty hearing, which can be confusing for some parents. For example, if you take a child with an auditory processing disorder into a quiet room and ask if she can hear you, she will usually say, “Yes.” However, if you turn on the television or take her into a loud room with lots of distractions, she may not be able to filter out the background noise and will no longer be able to process what you are saying. Some kids with auditory processing disorders hear the beginning of a sentence but not the end. They sometimes then fill in the parts they did not hear with what they assume was said. These kids may appear to not be following directions and just doing things their own way when, in fact, they just did not hear the instructions in their entirety. Seeing an audiologist can help to diagnosis this issue and learn to cope with it. Vision Problems – If your child is telling you that his vision is blurry or he has frequent headaches, you should take him to an ophthalmologist. 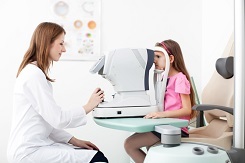 Often, vision issues do not get diagnosed until a child is in school and is having trouble reading, but some younger children will report vision issues to their parents prior to this. If your child tells you they are having issues seeing, it’s good to take heed because many vision problems can be corrected. Chronic Ear Infections – When a child gets chronic ear infections, usually more than three in a season or five in a year, it’s time to see an ENT or otolaryngologist. These doctors can make sure there is nothing more serious going on and can treat for these chronic infections, often by putting tubes in the ears for drainage. Delayed Speech or Trouble Articulating – If your child’s speech seems well behind that of his peers and people do not understand him, it may well be time to take him to a speech and language pathologist for treatment. Whether your child is non-verbal or has articulation issues, a speech therapist can work with him to correct it. Headaches, Weakness or Seizures – If your child has frequent headaches, experiences what you think is a seizure or has extreme weakness, a neurologist would be the specialist to see. Neurologists are also helpful for children who have been diagnosed with ADHD and learning disabilities. Bedwetting and Incontinence – If a child is over the age of seven and wets the bed more than two or three times per week, it is recommended that they see a pediatric urologist. This doctor can rule out infections, kidney problems and other health issues that may be causing the enuresis. The urologist can then offer treatment options. Digestive Issues – When a child is suffering from any ongoing digestive issue, such as constipation, acid reflux or nutritional problems, she should see a pediatric gastroenterologist. Pediatric gastroenterologists are specially trained to run tests and treat children specifically, and to ensure their comfort when they do so.